RIO RANCHO, N.M. (AP) — A 16-year-old boy accused of firing a gun at a New Mexico high school last week on the anniversary of the Parkland, Florida, shooting that killed 17 told officers 11 months earlier that voices were telling him to “shoot up the school,” according to a police report. 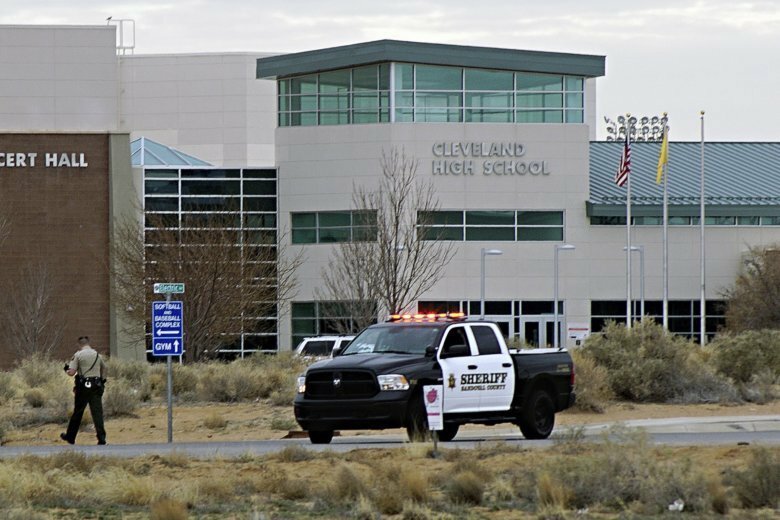 A police officer in the Albuquerque suburb of Rio Rancho was called to V. Sue Cleveland High School in March 2018 after a girl told school officials the teen had sent her text messages about bringing a weapon to campus, the Albuquerque Journal reported . “Ever since my dad got a gun from his friend something tells me I should shoot up my school and I don’t want to but I keep fighting it,” the text message said, according to the police report. The teen told police he “has been having feelings and hearing voices in his head for a little over a year telling him to ‘shoot up the school,’ ” an officer wrote in the report. The teen was not charged in connection with that 2018 episode and it was unclear if school officials took any action. Bethany Pendergrass, a spokeswoman for Rio Rancho Public Schools, said the district could not discuss any matters involving students. Police said the teen opened fire on campus last week before leaving the gun behind and running away. No one was hurt. After the teen was arrested, he gave officers a “to do list” he had in his pocket that indicated he wanted to kill his ex-girlfriend, kill other people and then kill himself, according to a police affidavit filed in court. The Associated Press is not naming the suspect because of his age. He faces charges of attempting to commit murder and unlawfully carrying a deadly weapon onto school grounds. A state district judge on Monday ordered the teen to remain in detention while undergoing mental health evaluations. Defense attorney Steven Archibeque said the family wanted the teen released so he could be evaluated by his therapist and personal doctors. Archibeque declined to comment on the specifics of the case. But prosecutors argued in court the teen posed a threat and that a state mental health evaluation was adequate. Archibeque said before the shooting the teen was taking medication for a number of mental health issues and underwent a psychiatric assessment two weeks ago. Students at the high school had been scheduled to return to class for the first time on Tuesday, but school was canceled because of snow.